Lake Chad, once the 6th largest lake in the world, has shrunk to 1/10 of its size 35 years ago, from 25,000 km2 in the 1960s to 500 km2 today. The lake’s depth is very shallow and responds dramatically to changes to water inflow and outflow. It was originally 7m deep in the 1960s and now averages only 1.5m deep. These changes in size are mainly due to a changing climate and the reduction of inflow by the major rivers that feed the lake. 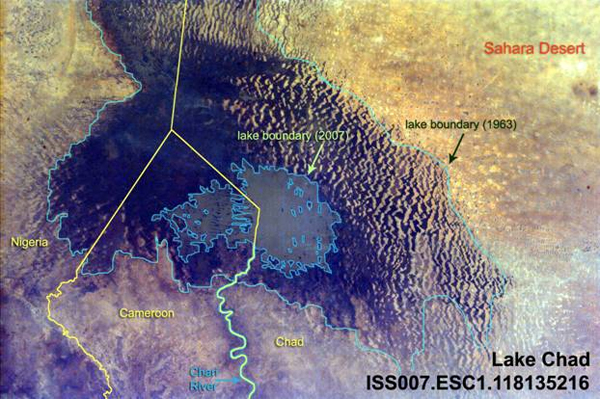 Lake Chad is part of the Conventional Basin which is part of the Lake Chad Basin in Northern Central Africa. The Conventional Basin consists of the four countries in direct contact with Lake Chad: Nigeria, Niger, Chad, and Cameroon; and covers a total land area of 427,500 km2 or roughly the size of Zimbabwe. More than 11 million people live in the Conventional Basin working to farm, raise livestock, mine, and fish. These people are among the most vulnerable to food scarcity in all of Africa. The diminishing volume of Lake Chad has serious effects on the political, social, and economic stability of the neighboring people. Efforts to replenish Lake Chad include damming a nearby river and channeling the water into the lake. The main tributaries of Lake Chad are the Chari, Logone, and Komadugu-Yobe rivers. 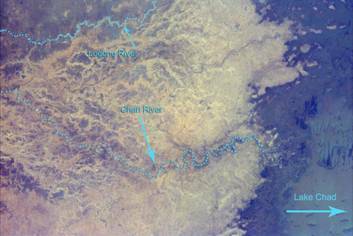 Flow patterns by these rivers have created a Grand Barrier, dividing Lake Chad into two regions: the southern region serviced by the Chari and Logone Rivers and the northern region serviced by the Komadugu-Yobe river system. The Logone-Chari river system provides 90% of the water fed into Lake Chad. Lower rainfalls, droughts and channeling of the water for irrigation systems upstream have reduced the flow of the river to 20 million cubic meters, about half the amount the flowed into Lake Chad in the thirties. 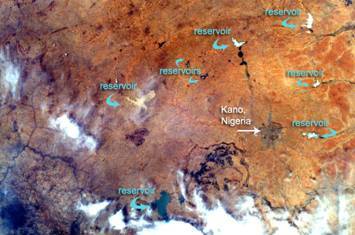 The Komadugu-Yobe river system is also important in providing water inflow to the northern part of Lake Chad. Located in northeastern Nigeria, the Komadugu Yobe is a network of rivers and wetlands. The Komadugu River, once joined with the Yobe River, but due to a decrease in flow by the construction of dams this is no longer the case. This reduction is river flow had dramatic effects on Lake Chad which, as a result, only gets water from this river system during the rainy season. 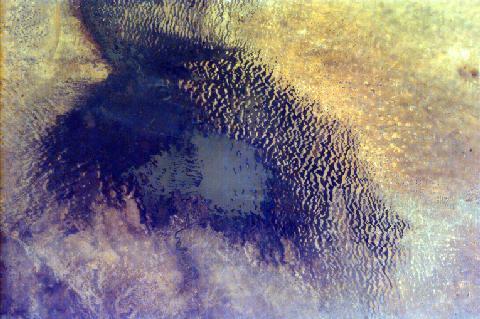 As the Sahara Desert creeps southward, the northern part of Lake Chad begins to resemble sand dunes. The shift from a once fertile area surrounding the lake is now suffering from desertification. This can be blamed on the overgrazing by herders, removing all forms of vegetation and leaving the land to be replaced by sand. With no more land for their livestock to graze on, herders find the need to move elsewhere, where land is already occupied. Also, as river water is diverted for irrigation, and global warming reducing rainfalls and increasing the intensity of droughts, the lake has shrunk in size leaving bare land in its place. Thus, with less water comes less fish and less people to make a living off fishing. These once fishers turn to farming the fertile land once occupied by the lake; however, this still leaves them the hassle of irrigating farmland in a desert. For those who can’t survive without adequate water supply, people are forced away to cities to compete with millions of others that are also struggling to survive. Water is essential to life, and it is up to the governments of these countries to save the 11 million people who rely on the waters of Lake Chad. One such initiative that has been taken is the research into damming the Oubangi River in the Central African Republic. The water would then be channeled into Lake Chad; however, there is no funding for this project.